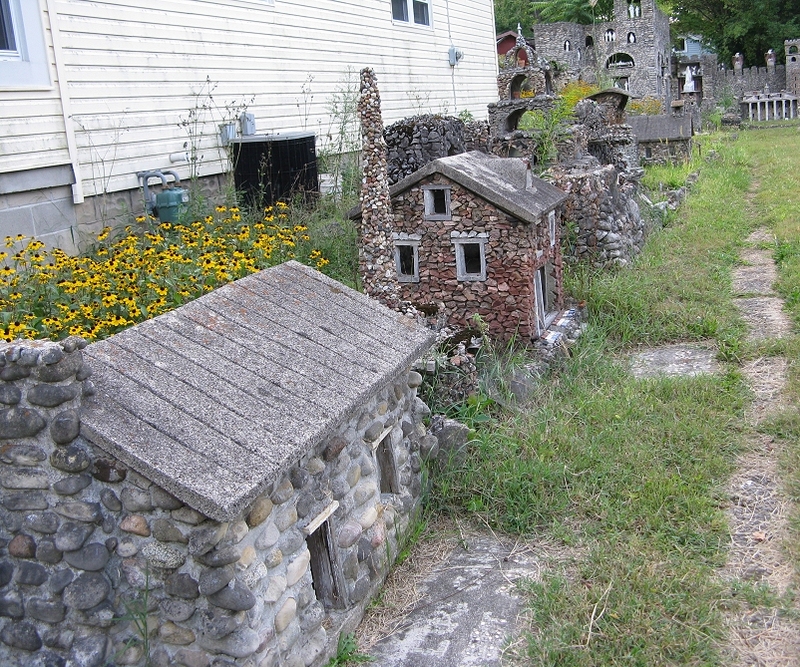 How long will my garden railroad buildings last? Several have gone six years or more without even needing a paint job - but I can't imagine any of them lasting more than, say fifteen years at the most. This is an article about buildings that have lasted, more or less, over 60 years, exposed, not only to the weather, but also to the risk of vandals for much of time. 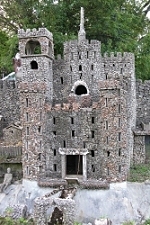 Of course, they were built, not of plastic, but of real building materials like stone and concrete. Although I've lived within six miles of these buildings for years, I first heard about H.G. 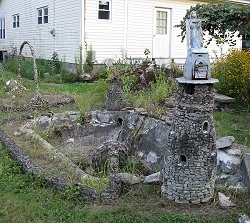 "Ben" Hartman's unique stone garden from September, 2006's Country Living magazine. If you can't find that article, that's okay, much of the same content is contained in Roadside America article on the subject. 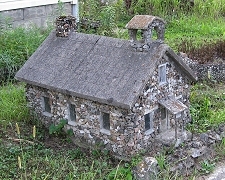 Other photos and links to pages about this site are available at the Hartman's Rock Garden site. As far as I can derive from the various sources, Springfield, Ohio resident Ben Hartman was between jobs during the Depression, when he took advantage of a WPA program to develop regional artists. He reasoned that his corner lot at McCain Street and Russell Avenue would be a good place for a fish pond that the neighborhood could enjoy. 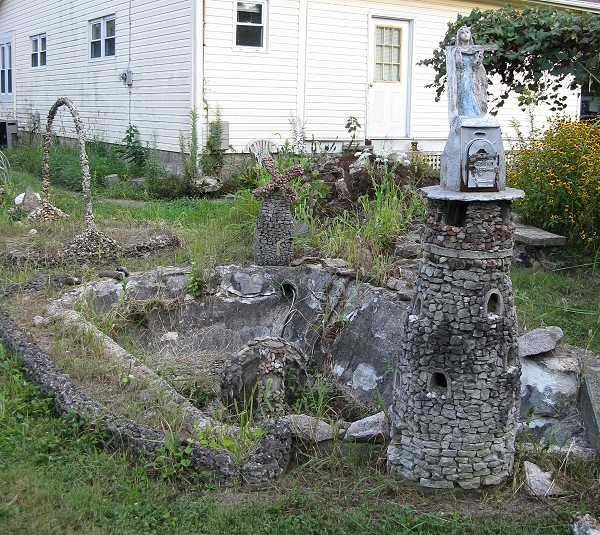 After the pond was built, he decided to decorate around it with small stones. Then he decided he liked building things from stones. 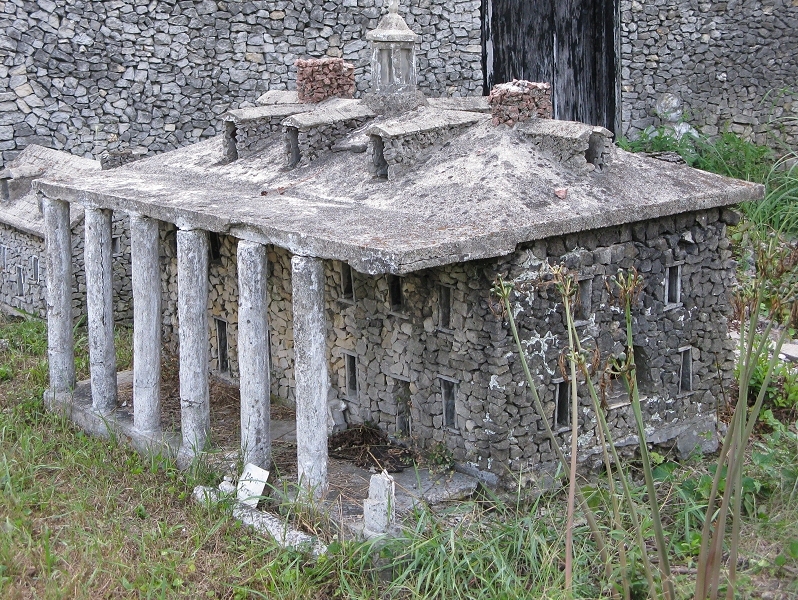 By 1939, he had filled his side yard with fanciful sculptures and tributes to many real buildings, including the White House and Mount Vernon (complete with "servant's quarters" out back). 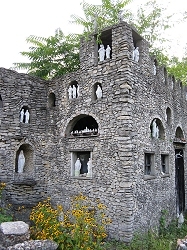 Though Hartman stopped adding new sculptures in 1939, the family kept the garden up for many decades. Still, maintaining that many stone sculptures was about impossible for anyone to do as an avocation. 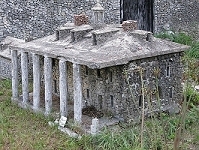 By the time the Country Living magazine came out, the ponds were dry and several of the buildings and individual sculptures were deteriorating. 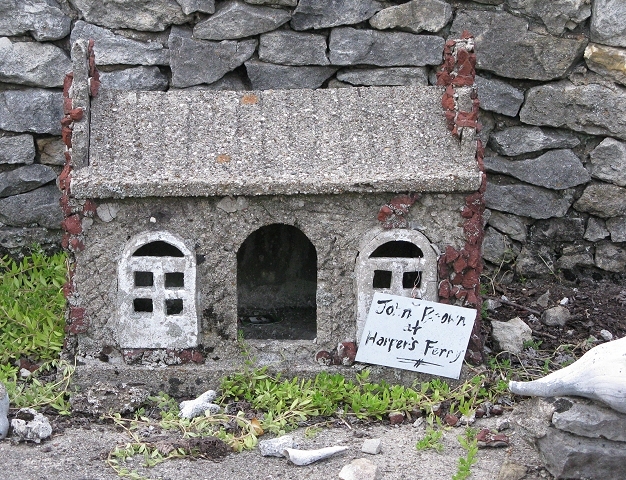 As of September, 2008, when I took the photos for this article, the property was for sale. 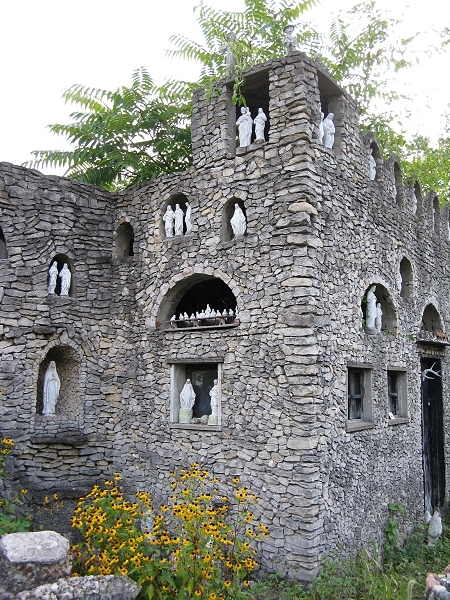 Except for the collection of religious statuary that decorates the "cathedral," many of the smaller features that were described in the Country Living and Roadside America articles were gone. The grass was mowed, however, so someone is still taking an interest in the property. Most of the buildings remain, and that's the part that interested me the most. For one thing, I wanted to figure out how you could make a miniature building that would survive decades instead of years. Obviously, Ben starting by choosing materials that folks used to use for real buildings. One stone cottage looked as though it was built the same way you would build a stone wall, with round stones actually making up part of the structure. 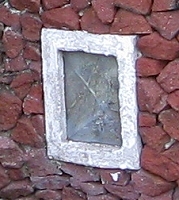 The roof, on the other hand, was a single cast piece. At first, I wondered if he cast it himself, but I've since decided that it must have been a commercial product, some sort of construction detail that Ben "repurposed" for this project. 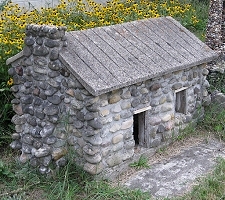 In case you wondered, this cottage is about 30" tall. Many more of Ben's structures look as though they were built on some sort of concrete frame, then had the stones mortared on. 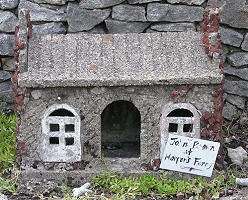 That includes the building at the right, which stands about 22" high. This house is an anomaly in another way, though. 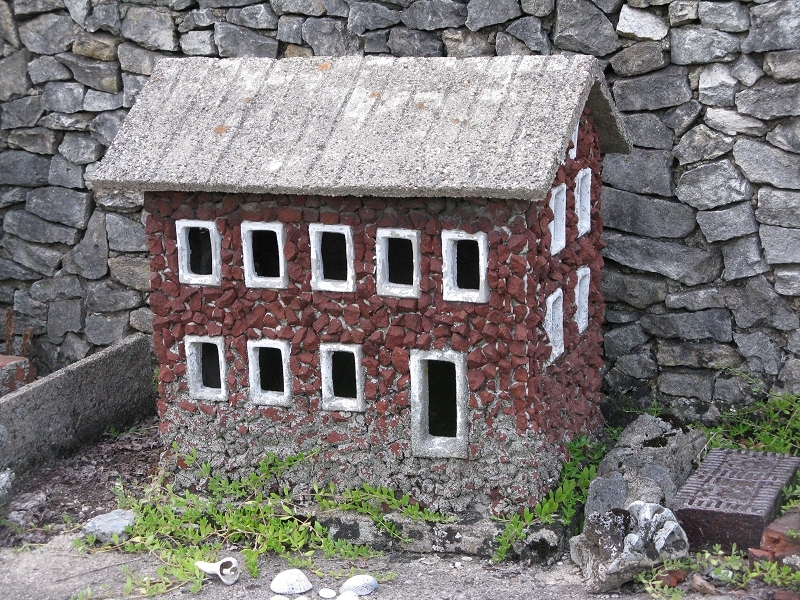 Most of the buildings have either wooden windowframes, like the cabin above, or concrete windowframes that are cast in one piece. This building's windows have no vertical framing, but they do have caps and windowsills that jut out, a nice detail. 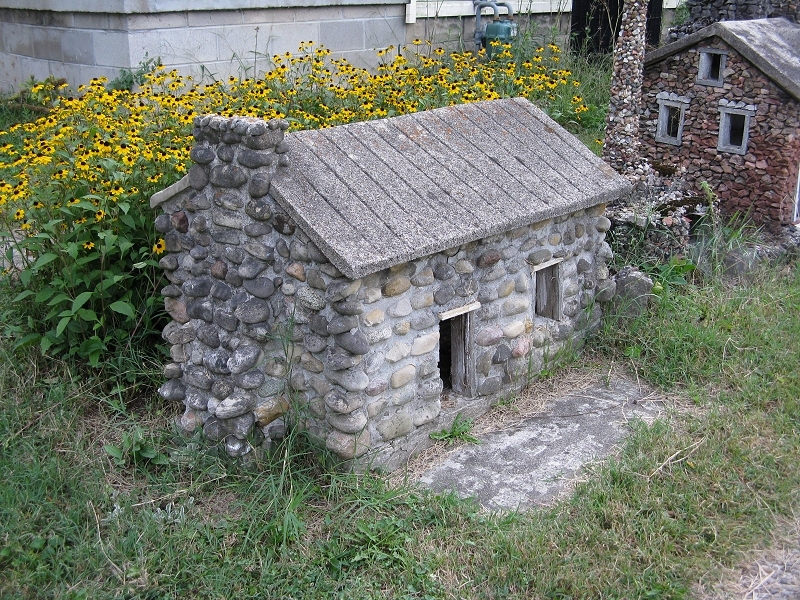 On thing that the Country Living article didn't get across was the size of some of these structures/buildings. 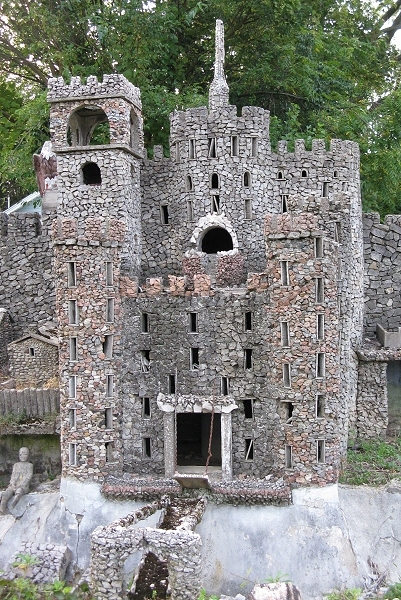 Most of the buildings are two to three foot tall, but the castle is at least eight foot tall, and the "cathedral," a backyard building with walls of niches that hold religious statuary, is closer to twelve. Thankfully, for folks like me who are more interested in the "how" than the "what," Ben left one building mostly assembled, but unfinished. It's one of the few buildings not featured in any of the articles or web sites that describe the garden, but I found it to be one of the most interesting. 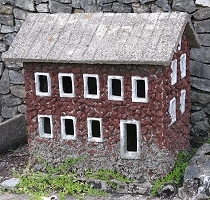 As you can see in the closeup, this building is assembled from several flat pieces that seem to be a consistent thickness. It looks almost like Ben was using the Depression-era equivalent of Wonderboard to build these structures, although there are no tool marks around the windows, something that's very hard to achieve when you cut anything made of or resembling concrete. If you look closely at the window openings in the blowup of the photo above, you'll note that the wall is actually two thicknesses thick, and the inner window opening is much less accurate than the outer opening. Ben may have "reinforced" the walls by doubling the material, though he wasn't as careful about the inner walls as he was the outer, since the windowframes would hide any rough patches anyway. Windowframe Options - One of the complications of modeling buildings is how to handle the windows. Most garden railroaders use mullions or some other sort of framing that represents the fact that most real "windows" on buildings built before 1960 aren't actually made from one big single sheet of glass. Ben Hartman, on the other hand, was more interested in "representing" than "modeling," so he found some simple ways to add the appearance of windowframes to his structures. On one building that I didn't photograph at the time because it was so deteriorated, Ben used a concrete "flange" that was probably designed for some drainage system to create a round window. Besides that exception, he seems to have used three basic approaches. The vast majority of Ben's buildings use wooden inserts to represent windowframes. 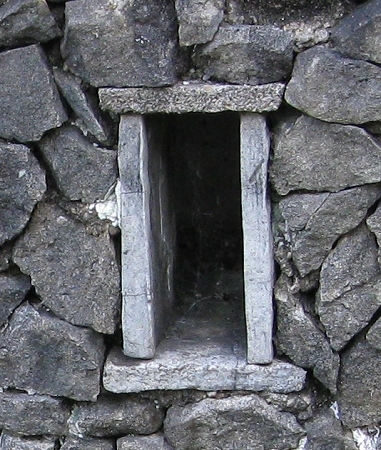 Some of the inserts tend to be almost as deep as they are long, because the walls of those buildings were so deep once the stones have been added to the outside. By now, many of the inserts have deterioriated to the point that they are shifting around; however, that causes no risk to the integrity of the structure. 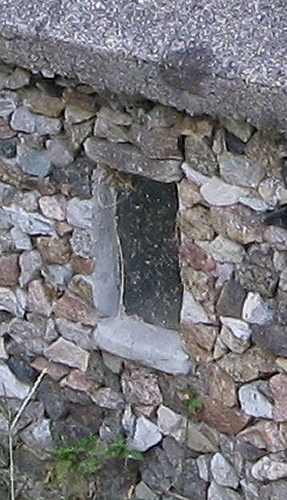 As shown in the second stone cottage reviewed in this article, Ben also experimented with ignoring the vertical "frames" and using stone or concrete caps and sills, a fine look if you ask me. Toward the end of Ben's building career, he seemed to be experimenting with windowframes that he cast himself, both plain and elaborate. Though the paint has faded on some of these, they are still holding up better than the wooden frames. Glazing - As you can tell from some of the window photographs above, Ben glazed many of his windows with real glass, cut to fit each window. I'm not certain how he fastened the glazing in place, but it is holding up remarkably well, considering how exposed these buildings have been to natural and other forces. If I was building similar buildings today, I'd be tempted to use acrylic glazing, but that stuff wasn't available in the 1930s. That said, much Ben's glazing is still intact, and all of it looks far better than the crystalized plastic window glazing I see on many aging garden railroad structures today. Other Veneer Options - With Ben's taste for stone, it's apparent he wasn't going to get too far from that material. Some buildings that were supposed to represent brick structures have receive a coating of crushed brick, though. Ben apparently used concrete or mortar to set the stones, which must have been a time-consuming process for buildings that were already assembled in place. The buildings below seem to be relatively late experiments. 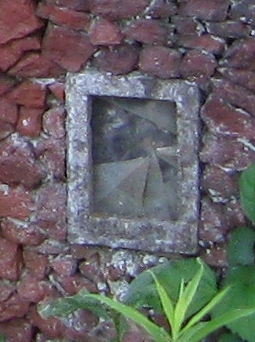 Both use molded windowframes and crushed brick, but the crushed brick only adhered to one of them - perhaps Ben had experimented with a different "mortar"? 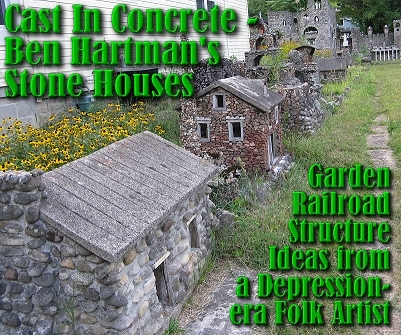 Today, most garden railroaders don't usually need buildings the size of small appliances. 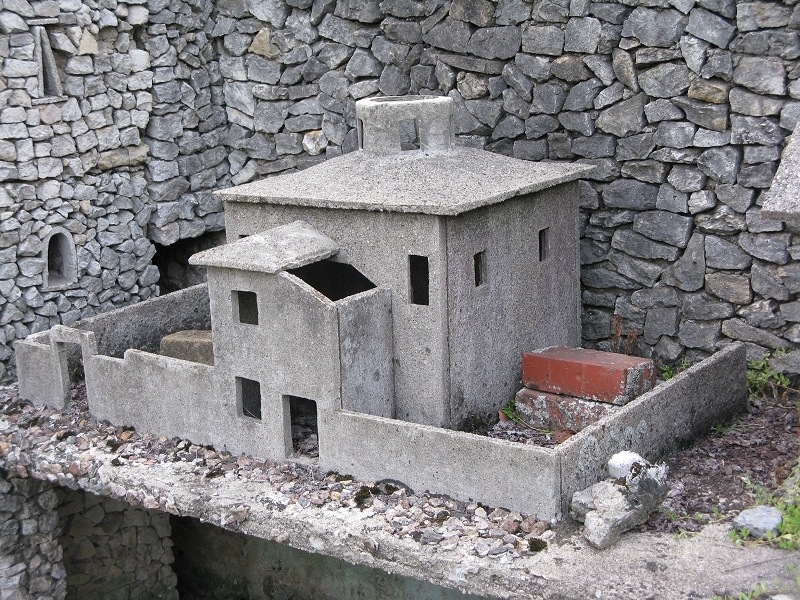 Still, many folks have experimented with various kinds of concrete construction, though they tend to use methods that require more finesse and less raw material than Ben Hartman used in his buildings. Here are just a few things people have tried. Cast Concrete Substructures - Some folks have created molds that they could use to cast structure walls, then fastened them together into buildings. 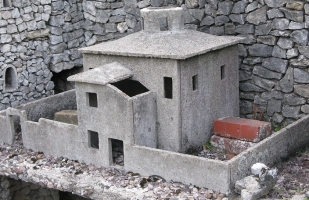 As an example, several years ago, a contributor to Garden Railways magazine made a mold by using vacu-formed plastic shapes from Applied Imagination. 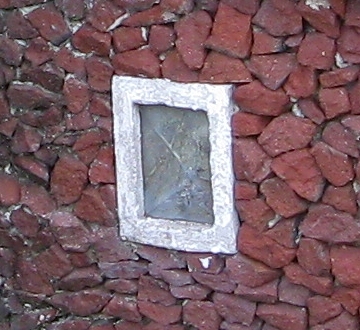 He made the "walls" by using the "rough brick" pattern, with cutouts and little wooden rectangles where the windows would go. (He used hardware cloth to reinforce the concrete as he molded it.) Then he poured the windows using one of the Applied Imagination window patterns. He also poured the roof from concrete, using yet another Applied Imagination pattern and more hardware cloth to reinforce it. 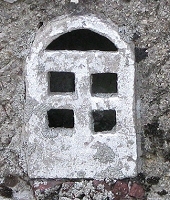 When he assembled the parts together, he used "drain pipes" to camouflage the joints between walls. All in all, the result was a very sturdy and unique structure. If I can find the back issue, I'll tell you where the article was. I'm sure that many other kinds of casting have been attempted - if you've had some experience along this line, we'd love to hear about it and share it with our readers. Jigstones - A method that seems easier to many garden railroaders is the Jigstone line of kits. 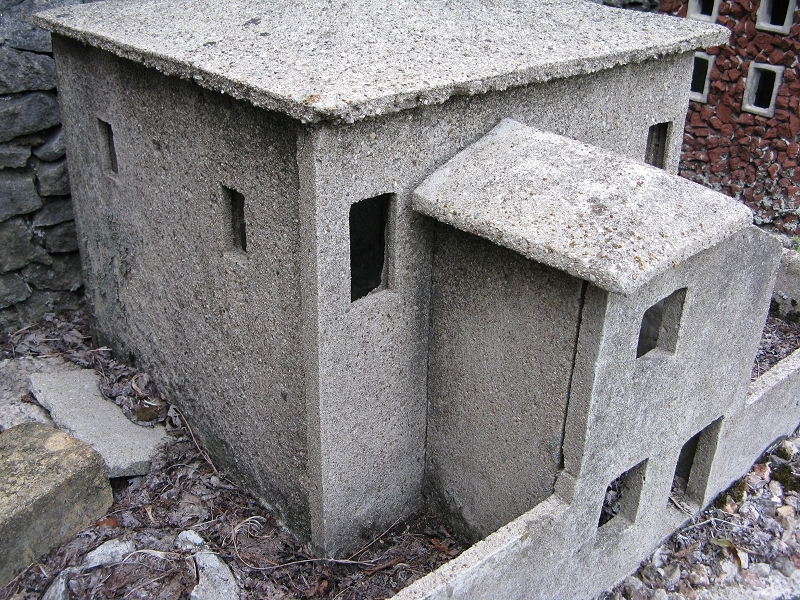 Each kit contains several flexible molds that you can use to make plaster (or concrete) "building blocks," which you then combine into buildings that are sturdy, unique, and heavy enough to keep from being blown over in high winds. The best article on using Jigstones that I have seen was written by George Schreyer, a fellow who tries every new technology out three or six different ways and reports his failures as well as his successes. George's article also describes how to make molds for casting plaster or concrete, so it's a great place to do research if you are thinking about molding your own building components and aren't sure where to start. Wonderboard Construction - If you don't know, Wonderboard is one of several brands of fiber-reinforced concrete that you buy in sheets to install in damp locations like shower stalls. It can be cut into pieces that can be assembled into garden railroad structures, but the folks I know who do it report that they use a lot of blades, and that the resulting structures are very heavy. If you have a particularly interesting structure project you'd like to tell other garden railroaders about, please contact me with the details, and I'll be glad to pass them on, giving you full credit, of course.